Spain - La flamme de la résistance ne doit pas s'éteindre et ne s'éteindra pas! On the 25 th of april at St Martin del Albere, he carries on by foot to Figueras.He hides in the country side but is forced to enter the town to catch a train. 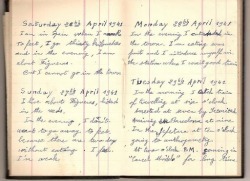 In his diary he explains the circumstances of his arrest.